Oculus, Mike Flanagan’s 2013 not-too-terrible film, was one I got behind, and when I realized another movie of his was hiding behind beyond generic Netflix art, it didn’t take me many months to give it a watch. In Hush we follow a deaf-mute writer who lives in secluded woods, and who soon enough is the target of an unknown n’er do well, imaginatively credited as «The Man». A literal hunt ensues — cross-bow and all — and for 81 minutes we get barely no dialogue in what turns out to be a tense enough story. 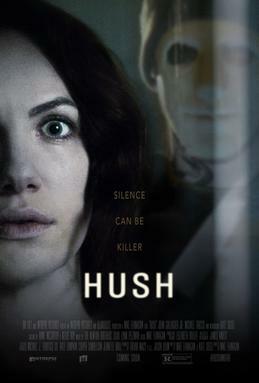 Co-written by Flanagan with his wife Kate Siegel (who also stars), there is a lot to admire about Hush. With a mere ten minutes of dialogue3, the plot manages to forge ahead without very little downtime or repetition. Siegel turns in a solid performance as the protagonist, as does John Gallagher, Jr. — the only person attached with much of a rap-sheet1 — among a cast of four2. Why is he going after the writer? Who knows! There are hints of human hunting being a sport for him, so I suppose that is reason enough. So yes, Hush is a bit of a minimalist movie, and we never even leave the grounds of the writer’s house. It makes sense, really. Flanagan’s stature wasn’t great at the time of filming, and making somewhat of an artsy thriller on a small scale is a good way to show your chops, if you get it right. For the most part it works, though things are a bit rough around the edges at time. The short run time could probably have stood to be cut down another ten minutes, if only to get rid off some unfinished-feeling scenes. This was clearly shot with some serious time constraints. The film did the trick for Flanagan, and he is now close to hitting the big time. Stephen King has proclaimed his admiration for both Hush and Oculus — this is indeed a King-esque story — and the two are set to collaborate on an adaptation of Gerald’s Game. Furthermore, Flanagan is making The Haunting of Hill House for Netflix (make sure to check out Robert Wise’s 1963 version, The Haunting, too) and I Know What You Did Last Summer for the big screen (hey, check that teen classic out, too! ), putting the director firmly in the «prolific» category. As for Hush, it is well worth the watch. Get past the ridiculous Netflix art, and you get a decent thriller with a clever conclusion. Could certain parts have been shaved off? Probably — the aforementioned scenes are a bit jarring, and they somewhat halt an otherwise nice flow. But hey, you’ve already paid for the movie, so there are few reasons not to give Hush a chance. It is an enjoyable, almost old-fashioned, plot-based thriller, and I very much mean that as a compliment. 1 He received third billing in both 10 Cloverfield Lane and The Newsroom. 2 Five if you count someone who appears on FaceTime for 15 seconds. 3 Initially there was a plan to have no dialogue. I kinda wished they had gone that route, as it if nothing else would have been a fascinating watch.